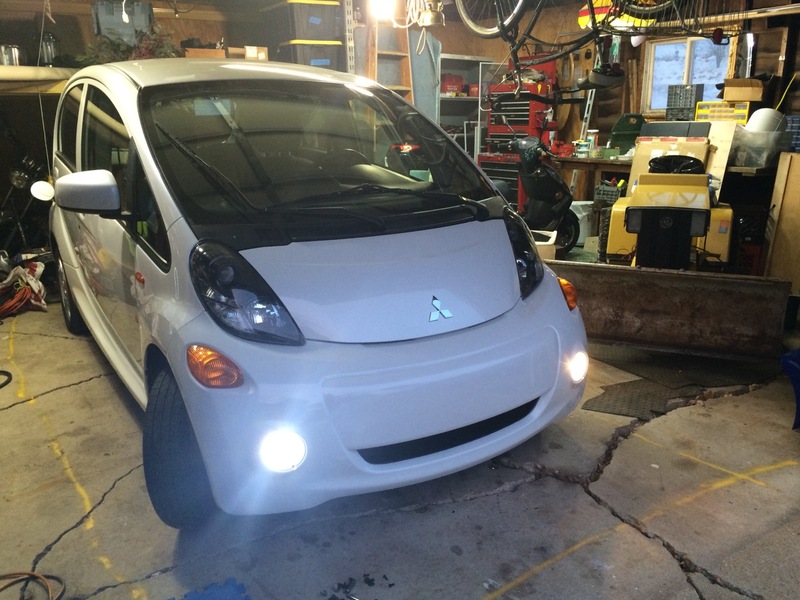 Seeing how nice the LED dome lights work on the Mitsubishi iMiEV electric car, I wanted to tackle converting the rest of the lights to LED. Up next would be the daytime running lights. The DLRs on this car are bulbs that mount inside the foglight assembly. They stick up on an angle, with a smaller reflector behind. Behind that is the larger reflector and halogen bulb of the much more powerful fog-light. 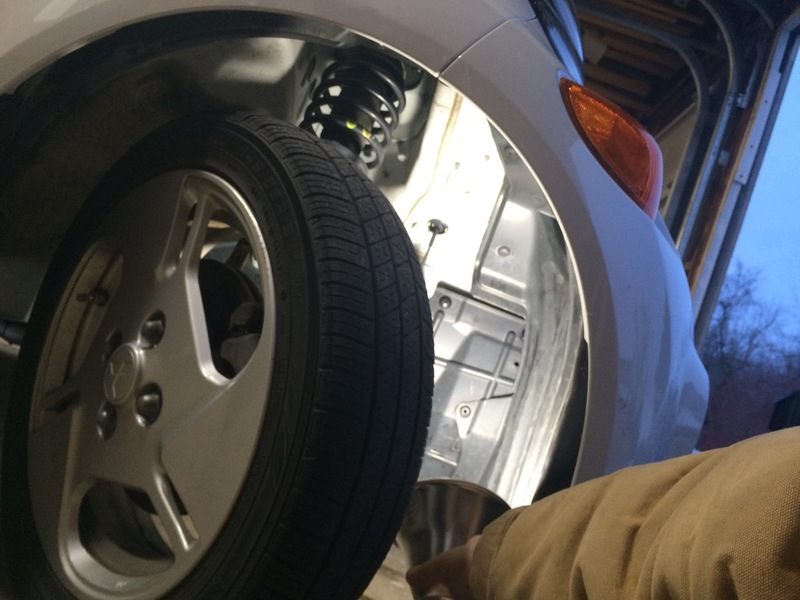 To get to the light on the iMiEV, I would need to remove the plastic fender liner. I turned the steering wheel all the way to one side. Because the car has such skinny front tires, it wasn’t necessary to remove the front wheel to get in through the wheel well. The finder liner is held on at the bottom by two 10mm bolts on the very bottom edge, and a number of phillips screws running through plastic inserts. I removed the two bolts and six screws. That let me pull back the plastic fender liner. The liner was still held to the car by screws in the middle and back of the wheel well, but I could get at the light. I unplugged the DRL bulb, then rotated the bulb counter-clockwise and pulled it out. The bulb itself is short and round. Physically comparing the incandescent and LED bulbs, it was easy to see that the LED bulb was longer. I then took the LED bulb and inserted it into the housing. However, it would EXACTLY not go in all the way! Was the length of the bulb preventing it from being fully inserted? No, looking into the housing from the outside, I could see there was plenty of room. So what was different? 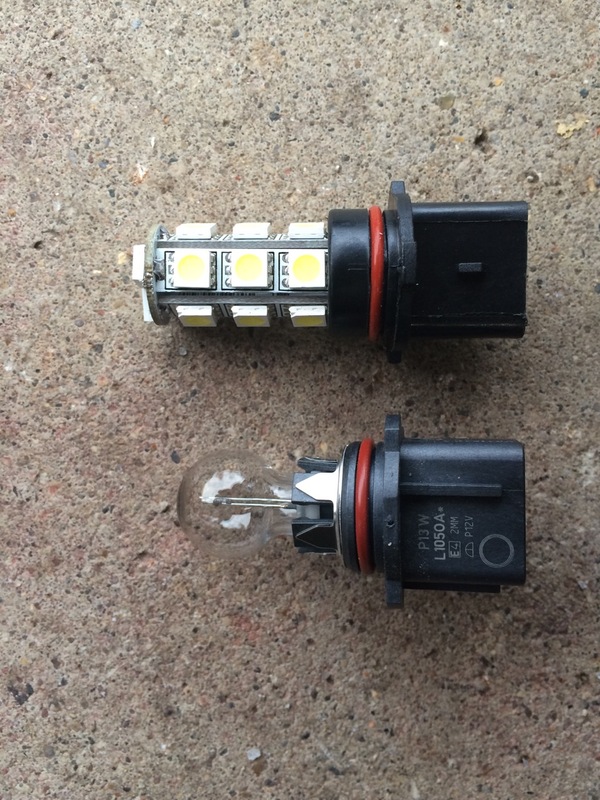 I pulled the bulb out, then compared the two bulbs side by side for minor differences. The one that I could see was that there is a black plastic “collar” that comes up on the LED bulb HIGHER than it does on the traditional bulb. In the photo on the left, compare how much black plastic there is to the left of the red o-ring on the two bulbs. It looked like the extra long plastic on the LED bulb was just barely striking the silver reflector, preventing it from being inserted all the way. Rather than completely removing the entire lighting assembly, taking out the inner reflector, modifying it, and reinstalling it, it seemed easier to hack the $4 light bulb! I got out my Dremel tool and put in a cut-off disc. I then scored a line around the plastic collar and made multiple passes until it was cut nearly all the way through. Then I inserted a flat screwdriver into the cut and twisted, to pop the ring of excess material free. I pulled off the ring and cleaned up any burrs of plastic. Next, I put the LED bulb into the fixture, pushed it all the way in, and twisted. It fit! I plugged in the power cable, then turned on the car to see the difference between the side with the incandescent bulb, and the side with the LED bulb. The LED bulb was clearly brighter. It’s also a better color. This is the “cool” LED color, which looks more like daylight. To me, it looks much more modern. 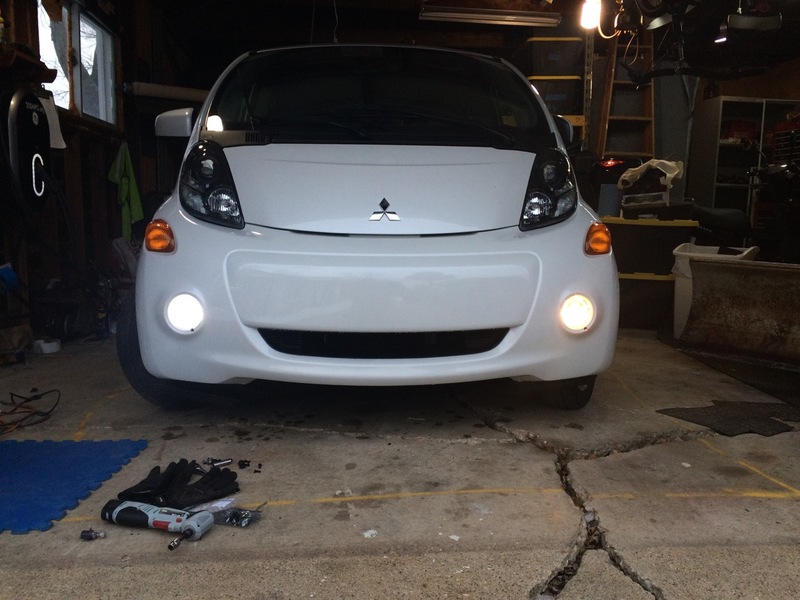 The little iMiEV is starting to get Sci-Fi Lighting, instead of the dull orange lighting of yesteryear. After that, I did the same upgrade on the other DRL. So, what have we learned? Unfortunately, there are still LED bulbs that are NOT exactly plug-and play. The dome lights and license plate lights both popped right in as direct replacements. For the DRLs? Not so much. Still, once I figured out what I needed to do, it was a pretty simple modification for a handy guy with the right tools. We are also seeing so many more new cars coming to market with complete LED and/or HID lighting packages on them. Besides saving energy, they also have great visibility and mean you may NEVER have to replace a lightbulb in your car ever again! LED bulb temporarily installed, but not fully in place in the reflector. LED bulb as seen through the front. Hello Ben , would Super Bright LED have an equivalent part number? 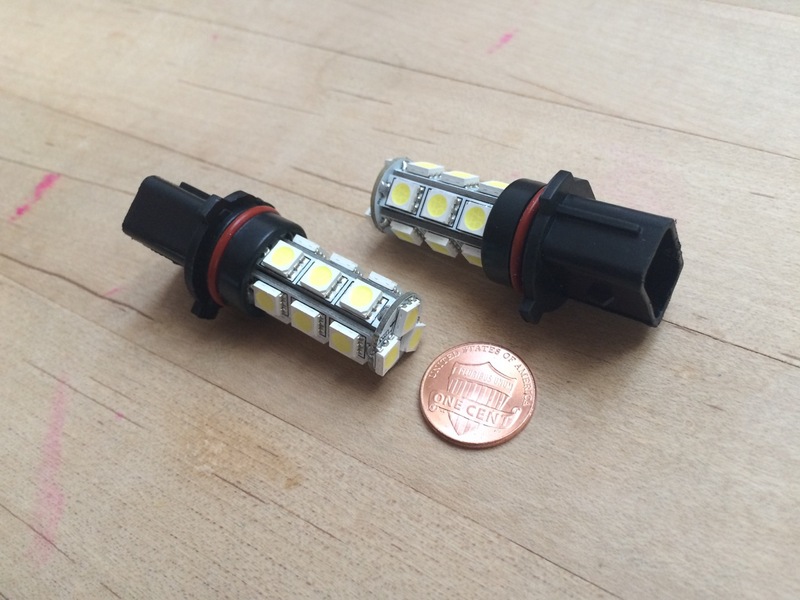 I searched Super Bright LED via car make and model and the light they propose has a 90 bend at the connector end, plug there doesn’t seem to be any locking tabs around the collar (near the o-ring gasket). Did you take any pictures of back side of the fog lamp? I’m wondering if it’s a loose wire harness that just plugs into the lamp socket ofr must the lamp be strainght like the one you bought? I searched Super Bright LED via car make and model and the light they propose has a 90 bend at the connector end plus there doesn’t seem to be any locking tabs around the collar (near the o-ring gasket). I’m wondering if it’s a loose wire harness (just like the headlights) that you just plugs into the lamp socket or must the lamp be strainght like the one you bought due to the cars connector? FYI: Amazon doesn’t ship these lights to Canada. I don’t have any good photos of the back of the fog-light assembly. It’s a tight fit – not easy to get a camera and light in there at the same time. The wire harness just has a plug that goes into the daytime running light. It didn’t seem like a bulb with a right-angle connector on it would fit. I think that the one listed on SuperBrightLEDs was the FOG light, NOT the Daytime Running Light. The DRL bulb is a P13W bulb. The one that I used was http://amzn.com/B00TEPTQN4 ordered from Amazon.com. There’s plenty other brands and vendors that sell similar bulbs. Look for a P13W from a vendor that will ship to you at the price you like. 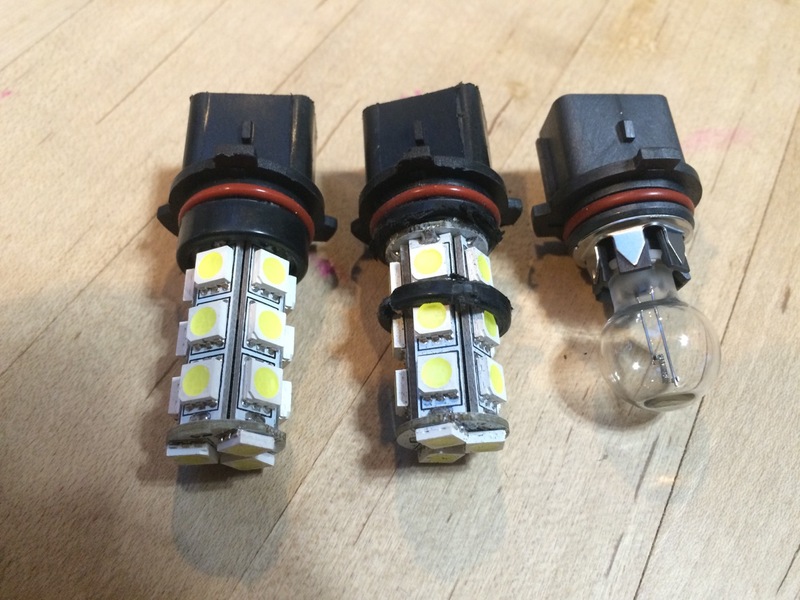 The only similar bulbs that I found on SuperBrightLED had large braid loops and a separate driver board. They were also considerably more expensive than the bulbs I used. Previous post: LED Lighting Upgrade!